Farm Food is in its origins, and still remains, a family business. In the beginning it was run for several years by Gerrit de Weerd and his wife, with the help of their two sons, then still at school. Over the years the business has kept expanding, with more staff . In 1982, because of his knowledge and experience in the area of animal nutrition in general (both within the Netherlands and elsewhere), Gerrit de Weerd became involved in the development of a dog food that was to serve as a neutral test food in research into the quality of the various makes of dog food that were then on the market A pressed pellet was developed on the basis of Dutch beef which is fit for human consumption, without any additives such as colourings, aromas, antioxidants etc. The starting point was that the food needed to be suitable for dogs of all ages and conditions. In so doing the simple fact was referred back to that in the wild all members of the dog family, from puppy to senior, eat as much as they need of the same food source , based on the prey that is available at the time. When the test was finished in 1984, after 2 years, it emerged that a number of breeders wished to be able to continue using the neutral ‘all life stage’ food, because of its excellent results. For this reason the decision was made to put the neutral test food on the market on a small scale, under the name of Farm Food HE. Word of mouth recommendation has led to continual growth since 1984. The composition of the food has remained essentially unchanged and the positive reactions keep on coming right up to today. The most striking and very frequent reaction is that older dogs whose diet is switched to Farm Food appear to enjoy a second youth, and that ages far beyond ten years are generally reached. 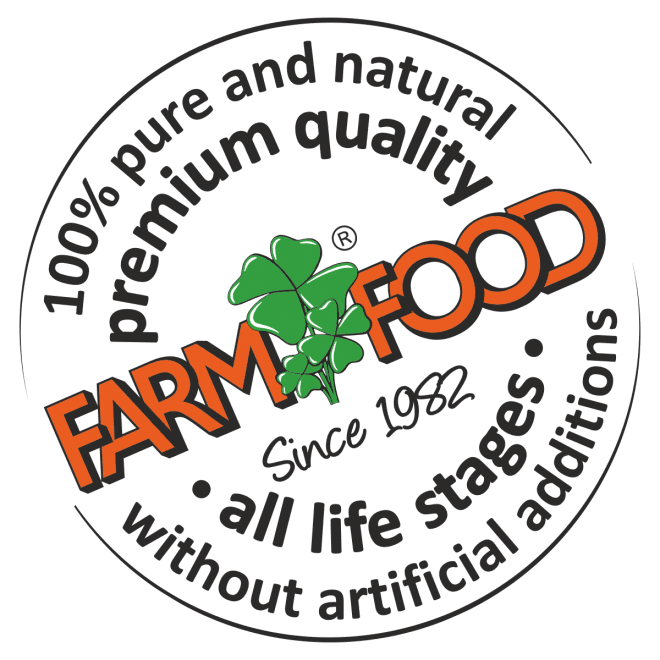 Naturally Farm Food HE has improved over the years, both from our point of view and a scientific point of view, however we have never lost sight of the original philosophy of “one type of food for all dogs of all ages and circumstances”. Over the years demand grew for articles for dogs to chew, of a quality matching Farm Food’s philosophy, and that could therefore be given in addition to Farm Food dog food, without the risk of health problems. A suitable product was found in South America, where the binding tissue from beneath the skin of free range beef cattle was processed to make chewing articles. Farm Food Rawhide is a clean product that is guaranteed completely free of additives and is also free of any heavy metals. The most important thing with this chewing product is that it functions as a toothbrush. Collagen is released during chewing, and this helps reduce and/or prevent plaque. Until 2001 Gerrit de Weerd remained partially active as an animal nutrition adviser both home and abroad. In 2001 he decided that from then on he would concentrate fully on the market for pet food, and to work full time as a director of Farm Food B.V.. In 2005 a new product is added to the assortment, this time based on a completely new concept. A milk powder is created, based on full cream goat’s milk which is fit for human consumption (instead of the usual skimmed cow’s milk). Although the product was only originally intended for puppies and kittens, it emerged that other small mammals also thrive on this milk. This means the likes of rabbits, squirrels, hedgehogs, chinchillas, mice, etc. Farm Food No.1 is really unique and is therefore patented with patent no. 1029707. In 2008 Farm Food establishes its own line of fresh meat. Farm Food has always advised having a day when fresh meat based on tripe is given at a set time, in addition to dried food, in order to achieve optimal intestinal flora function. As is known within human health care ‘health begins in the intestine’ and that is certainly also true for our dogs. The fresh meat products on offer at that time were very varied and of mixed quality. For this reason we decided to create our own line. The Farm Food team searched for a long time for a clean reward titbit that would also be thoroughly healthy. In the end this became Trainers, pure beef heart, dried and cut up in small handy chunks. This product is also particularly well received amongst users, both owners and dogs. In this year a completely new chewing product is added to the range. Antlers are deer antlers that have been shed, a product that matches Farm Food’s Philosophy perfectly, and which goes back to the origin of our dog, the wild members of the dog family. In nature, wild dog related species certainly use these deer antlers to satisfy their need to chew. Besides that it is naturally an extremely animal-friendly product, which because of its hard structure also provides extra long chewing pleasure. The antlers are cut up into various sizes. Farm Food is in its origins, and still remains, a family business. In the beginning it was run for several years by Gerrit de Weerd and his wife, with the help of their two sons. The sons have in the meantime finished studying several years ago and both work in the business. In total 14 people work on the mission to get the Farm Food products to where they belong, both in the Netherlands and throughout Europe: to serious dog lovers who want the best for their dog.